Jasmonates are phytohormones derived from oxygenated fatty acids that regulate a broad range of plant defense and developmental processes. In Arabidopsis, hypocotyl elongation under various light conditions was suppressed by exogenously supplied methyl jasmonate (MeJA). Moreover, this suppression by MeJA was particularly effective under red light condition. Mutant analyses suggested that SCFCOI1-mediated proteolysis was involved in this function. However, MeJA action still remained in the coi1 mutant, and (+)-7-iso-JA-L-Ile, a well-known active form of jasmonate, had a weaker effect than MeJA under the red light condition, suggesting that unknown signaling pathway are present in MeJA-mediated inhibition of hypocotyl elongation. EMS mutant screening identified two MeJA-insensitive hypocotyl elongation mutants, jasmonate resistance long hypocotyl 1 (jal1) and jal36, which had mutations in the phytochrome B (PHYB) gene. These analyses suggested that inhibition of hypocotyl elongation by jasmonates is enhanced under red light in phyB dependent manner. The online version of this article (doi: 10.1007/s10265-012-0509-3) contains supplementary material, which is available to authorized users. Jasmonic acid and its derivates, collectively called jasmonates, are members of a plant hormone class derived from plastid membrane lipids. Jasmonates trigger senescence and inhibit root growth (Ueda and Kato 1980; Leshem 1988; Staswick et al. 1992). Wound-responsive proteins in tomato can be induced by methyl jasmonate (MeJA) treatment (Farmer and Ryan 1992). To date, jasmonates are considered important plant hormones with various roles in plant defense and diverse developmental processes (Turner 2007; Koo and Howe 2009). In Arabidopsis, several enzymes including allene oxide synthase (AOS) and 12-oxo-phytodienoic acid reductase (OPR3) are involved in the biosynthesis of jasmonic acid (Schaller et al. 2000; Stintzi and Browse 2000; von Malek et al. 2002). Jasmonate resistance 1 (jar1), which encodes a JA-amino synthetase, was isolated based on root growth inhibition by exogenously supplied jasmonates (Staswick et al. 1992, 2002; Staswick and Tiryaki 2004). The enzyme catalyzes the formation of jasmonoyl-l-isoleucine (JA-Ile) from jasmonic acid. Subsequently, (+)-7-iso-jasmonoyl-l-isoleucine ((+)-7-iso-JA-L-Ile) was found to be the bioactive jasmonate in Arabidopsis (Fonseca et al. 2009). Three other essential jasmonate-insensitive mutants (coronatine insensitive 1 (coi1), jasmonate insensitive 1 (jin1), and jasmonate-insensitive 3 (jai3)) were also identified by the effect of jasmonate on root elongation (Feys et al. 1994; Berger et al. 1996). COI1 encodes an E3 ubiquitin ligase that is part of the SCF (Skip/Cullin/Fbox) E3 ubiquitin ligase complexes (SCFCOI1), which degrades target proteins and suppresses downstream gene transcription (Xie et al. 1998). JIN1 encodes MYC2, a jasmonate responsive basic helix-loop-helix transcription factor that regulates transcription of various jasmonate-regulated genes (Lorenzo et al. 2004; Dombrecht et al. 2007; Pozo et al. 2008). After 10 years of COI1 research, 12 jasmonate ZIM domain proteins (JAZs; JAI3 and its 11 analogs) were identified as the targets of SCFCOI1 (Chini et al. 2007; Thines et al. 2007; Yan et al. 2007). A central jasmonate signaling perception and transduction model was established based on the JA-Ile-mediated binding of JAZ and COI1 (Farmer 2007). This model starts with JA-Ile-dependent binding of SCFCOI1 to JAZ proteins, which leads to SCFCOI1-mediated degradation of JAZ repressors, releasing transcription factors like MYC2 and activates downstream gene expression (Chini et al. 2007; Thines et al. 2007; Fernández-Calvo et al. 2011). Furthermore, (+)-7-iso-JA-L-Ile synthesized by JAR1 is an exclusive signaling compound mediating JAZ and COI1 interaction but not other optical isomers (Fonseca et al. 2009). JAs are also significant signals in photomorphogenesis. A MYC2 mutation causes a shorter hypocotyl under continuous blue light conditions, suggesting that MYC2, which binds to JAZs, acts as a negative regulator of blue light-mediated photomorphogenesis (Yadav et al. 2005). Furthermore, MYC2 binds to the promoter region of SUPPRESSOR OF PHYTOCHROME A1, an important negative regulator of photomorphogenesis (Gangappa et al. 2010). The fin 219 mutant exhibits a far red-specific long hypocotyl compared to the wild type and has an epigenetic mutation of JAR1, which is a link between phytochrome A (phyA) and the downstream regulator constitutive photomophogenic 1 (COP1) in light-mediated control of Arabidopsis development (Hsieh et al. 2000; Wang et al. 2011). In rice, OsJAR1 is involved in both jasmonate and phytochrome signaling (Riemann et al. 2008). COI1 is necessary for far-red light-induced transcription factor expression, and coi1-16 flowers earlier than the wild type, suggesting that COI1 is involved in both the phyA- and phytochrome B (phyB)-dependent light signaling pathways (Robson et al. 2010). Several photomorphogenesis-related genes are involved in jasmonate signaling. A phytochrome chromophore mutant hy1 overproduces jasmonates and elevates expression of jasmonate-responsive genes (Zhai et al. 2007). A phyA mutation blocks jasmonate-mediated expression of VEGETATIVE STORAGE PROTEIN 1 (VSP1), a typical jasmonate responsive gene, under dark or far-red light conditions (Robson et al. 2010). The PHYTOCHROME AND FLOWERING TIME1 (PFT1) gene, which encodes MEDIATOR25, is a key regulator of the jasmonate-dependent defense response in Arabidopsis. Impairment of this gene causes decreased expression of MYC2, OPR3, VSP, and PLANT DEFENSIN 1.2 (PDF1.2) after jasmonate treatment (Kidd et al. 2009). To investigate the crosstalk between jasmonate and light signaling, jasmonate function in Arabidopsis hypocotyl elongation under various light conditions was examined. Hypocotyl elongation was suppressed by MeJA particularly under red light condition. Several jasmonate-resistant mutants were identified in screens of MeJA effects on hypocotyl development. Two of these mutants had a phyB mutation, demonstrating its importance in jasmonate signaling. Wild-type (Col-0, Ler, Ws) and mutant plants used in this study were obtained from Arabidopsis Biological Resource Centre, except the coi1 (see below). Seeds were surface-sterilized and sown on Murashige–Skoog medium agar plates with 1 % (w/v) sucrose (except in Figure S3). Seeds were incubated for 2 days at 4 °C, and germination was initiated by 4 h of irradiation with white light before transferring to the different growth conditions. Seedlings were grown at 23 °C with continuous different light conditions (provided by LEDs). For dark treatment, plates were wrapped in two layers of aluminum foil. Plates were placed in a vertical orientation. For JA treatment, seeds were sown on the plates containing different concentrations jasmonates. (−)-JA-L-Ile and (+)-7-iso-JA-L-Ile were chemically synthesized as described (Ogawa and Kobayashi 2012). Root and hypocotyl length was measured according to Kobayashi et al. (2009) with minor modification. Briefly, seedling growth was captured on a digital camera (Nikon D80), and primary root length and hypocotyl length were measured with image analyzing software (ImageJ; http://rsb.info.nih.gov/ij). The temperature-dependent COI1 single mutant coi1-16s was screened from a F3 seed pool of crosses between Col and coi1-16 (kindly provided by John G. Turner). MeJA-insensitive plant genomes were analyzed with polymerase chain reaction (PCR) and AciI digestion (Westphal et al. 2008). F3 seeds were screened by phenotype and sequencing of COI1 and PENETRATION2 (PEN2) loci to confirm a single point mutation in COI1 locus. Both coi1-16 and coi1-16 single mutant (coi1-16s) were maintained at 16 °C to obtain seeds. Ethyl methanesulfonate (EMS)-mutagenized M2 seeds of the Col-0 wild-type accession were obtained as described by Leyser et al. publication (from TAIR). Approximately 20,000 M2 seeds were germinated and grown vertically on medium containing 50 μM MeJA for 10 days. Seedlings with longer hypocotyls were selected as jal mutant candidates and directly transplanted into soil. M3 seeds from the putative mutants were confirmed as having a long hypocotyl phenotype on medium containing 10 and 50 μM MeJA. The original jal mutant was backcrossed to Col-0 for two generations, and the resulting homozygous progenies were used in this study. PHYB extraction and western blotting were performed as described by Leivar et al. (2008). Generally, for PHYB immunoblots, total protein was extracted using extraction buffer [100 mM MOPS (pH 7.6), 2 % (w/v) SDS, 50 mM metabisulfite, 10 % (v/v) glycerol, 4 mM EDTA, 2 μg/L aprotinin, 3 μg/L leupeptin, 1 μg/L pepstatin, and 2 mM phenylmethanesulfonylfluoride]. Total protein was quantified using a Protein DC kit (Bio-Rad), and 40 μM β-mercaptoethanol was added just before loading. Monoclonal antibodies anti-BA02 specific to the C-terminal domain of PHYB was used to immunodetect PHYB (Matsushita et al. 2003). Anti-mouse horseradish peroxidase (Thermo scientific; http://www.perbio.com/) was used as a secondary antibody, and ECL-plus western blotting detection system (GE healthcare Amersham; http://www.gelifesciences.com/) were used for detection. Hypocotyl elongation is controlled differently by various light conditions such as dark, red, blue, and far-red light. Jasmonates are inhibitors of regeneration and suppress root development in a SCFCOI1-dependent manner (Xie et al. 1998). Here, the effects of jasmonates on Arabidopsis hypocotyl development under continuous red light (Rc), blue light (Bc), far red light (FRc) and dark were analyzed. To compare the jasmonate effect among different light conditions, we firstly established appropriate light intensity to get a similar hypocotyl length in different light conditions without jasmonate. Otherwise, hypocotyl inhibition by Bc and FRc are much stronger than Rc, and resulting shorter hypocotyl may prevent to correctly compare jasmonate action under various light conditions. Exogenous MeJA inhibited hypocotyl elongation in the wild type in a concentration dependent manner in all four light conditions (Fig. 1a, S1). However, under Rc, MeJA showed much stronger effect than those under Bc, FRc (Fig. 1a) and dark (Figure S1A) (P < 0.01 in all concentrations). These results suggest that some jasmonate signaling pathway was activated under Rc. Jasmonate signaling is largely dependent of COI1, a central component of jasmonate signaling. coi1-1 a null mutant of COI1 is generally utilized to analyze COI1-dependence in various jasmonate-mediated physiological events. However, coi1-1 is male-sterile, and thus, utilization of this mutant for detailed analysis of hypocotyl suppression by jasmonates under various light conditions is quite difficult. In order to analyze the COI1 function on hypocotyl suppression by jasmonate, a temperature-dependent COI1 single mutant (coi1-16s) was isolated from F3 seeds of coi1-16 (Ellis and Turner 2002; Westphal et al. 2008) back-crossed with wild type (Col) to eliminate another mutation at PENETRATION2 (PEN2) in coi1-16, since this additional mutation may cause unknown effects on the hypocotyl elongation. Genome DNA sequences at the mutation sites of COI1 and PEN2 were determined and confirmed that coi1-16s have a mutation at COI1 but not at PEN2. Temperature-dependency of coi1-16s was examined in Figure S2 and it showed similar results with coi1-16 which is insensitive to MeJA treatment under 23 °C but not 16 °C. In contrast to the wild type, the effect of MeJA was partially abolished in the coi1-16s hypocotyl because of impaired COI1-dependent jasmonate signaling under Rc (Fig. 1b, c) and dark (Figure S1A). These results indicate that jasmonates suppress hypocotyl elongation under dark and Rc in a SCFCOI1-dependent manner. However, under Rc, almost half of the inhibition still remained even in the coi1-16s mutant (Fig. 1c), suggesting that a COI1 independent signaling is also present in MeJA-mediated inhibition of hypocotyl elongation under red light. To determine whether the MYC2, downstream transcription factor of jasmonate signaling, was involved in hypocotyl suppression, hypocotyl elongation was analyzed in the myc2 mutant. In the dark, MYC2 knockout resulted in resistance to MeJA-induced hypocotyl inhibition, similar to root elongation (Fig. 2a, c). However, under Rc with MeJA addition, myc2 hypocotyl elongation was suppressed to a similar extent as the wild type (Fig. 2b, e). These results suggest that MYC2 is required for JA signaling during hypocotyl inhibition under dark but not Rc conditions. We considered whether the active jasmonate conjugate on hypocotyl inhibition under red light was different from root suppression. Jasmonoyl-l-isoleucine, which is biosynthesized from jasmonic acid by JAR1 (Staswick et al. 1992, 2002; Staswick and Tiryaki 2004) was analyzed by the effect on hypocotyl elongation. The isomer (+)-7-iso-JA-L-Ile was identified as an active form that triggers binding of COI1 and JAZ proteins (Fonseca et al. 2009). In this study, the jar1 mutant was insensitive to MeJA, with the hypocotyl elongating longer than the wild type in both the dark and red light after MeJA addition (Fig. 2a, b, e). Furthermore, (+)-7-iso-JA-L-Ile suppressed root development in the wild type and jar1 which was largely insensitive to MeJA (Fig. 2c), validating previous results (Fonseca et al. 2009) and supporting the idea that (+)-7-iso-JA-L-Ile is a ligand of COI1 in root elongation. Unexpectedly, (+)-7-iso-JA-L-Ile was less effective on wild-type hypocotyl development than MeJA under Rc (Fig. 2b, d) and dark (Fig. 2a). It was shown that (+)-7-iso-JA-L-Ile suppressed hypocotyl elongation under Rc in a concentration dependent manner; but it showed weaker effect than MeJA on Col in all concentrations (P < 0.01 in all concentrations) even at 100 μM (Fig. 2d). And in coi1-16s mutant, (+)-7-iso-JA-L-Ile function was almost abolished under Rc (Fig. 2d). From these results, we suggest that MeJA itself or an unknown jasmonate-related compound derived from MeJA may be responsible for regulating downstream signaling and affects hypocotyl elongation under red light. To uncover the COI1-independent jasmonate signaling pathway involved in hypocotyl elongation, mutants were screened for jasmonate suppression of hypocotyl elongation. EMS mutant seeds (M2) were screened on MeJA-containing MS medium under constant red light. From 20,000 M2 seeds, 56 mutants displayed longer hypocotyls but similar root lengths compared to the wild type under Rc. Among them, jasmonate long hypocotyl 1 (jal1) and jal36 were confirmed as partially insensitive to MeJA for hypocotyls elongation (but not for root elongation) under red light (Fig. 3). Although jal1 and jal36 exhibited longer hypocotyls than the wild type even in the absence of jasmonates, MeJA was relatively less effective on the mutants than on wild-type plants (Fig. 3, S1F). These results indicate that the mutated gene(s) of these two mutants play a pivotal role in jasmonate signaling during hypocotyl elongation. With white light, jal1 and jal36 had longer hypocotyls and petioles, and smaller blades than the wild type (Figs. 3, 4a). These phenotypes were consistent with the known phyB-9 mutant, which lacks a red light receptor phyB (Somers et al. 1991). We hypothesized that jal1 and jal36 mutants had a loss of function of phyB, and hence, their PHYB loci were analyzed. Sequencing revealed that PHYB loci in both jal1 and jal36 possessed a point mutation resulting in a truncated protein and a D64 N mutated protein, respectively (Fig. 4b). Further analysis with western blotting was performed to clarify the PHYB content. Like phyB-9, the stop codon generated by a point mutation caused elimination of phyB in jal1, whereas PHYB was detected in jal36 (Fig. 4c). However, according to Oka et al. (2008), the D64N mutation probably caused deactivation of the phyB protein in Arabidopsis. To confirm that the impairment of jasmonate signaling under Rc was actually due to phyB knockout, MeJA sensitivity of the phyB-9 mutant under Rc was tested. As expected, phyB-9 hypocotyls after MeJA addition were relatively longer than in the wild type (Fig. 4d, S1B), which is consistent with observations in jal1 and jal36 (Fig. 3a, S1F). It indicates that the phyB mutation in jal1, jal36, and phyB-9 partially increased MeJA resistance in hypocotyl inhibition under red light. In contrast to phyB phenotype under red light, phyA mutant (Ler background phyA-201) did not show MeJA insensitivity even under far-red light conditions (Figure S1C, S1D). This result rather showed that phyA mutation caused hypersensitive phenotype to jasmonate which is different with phyB, indicating complicated crosstalk between jasmonate and light signaling. 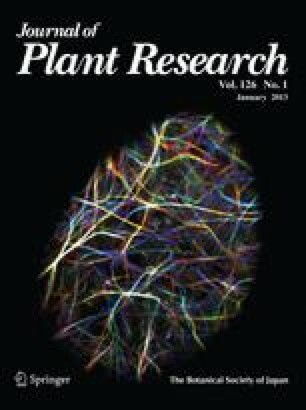 The plant defense-related phytohormone jasmonate inhibits Arabidopsis root development (Xie et al. 1998). Several important jasmonate signaling genes such as COI1, JAR1, MYC2, and JAZ were isolated by screening for the jasmonate effect on root development (Staswick et al. 1992; Feys et al. 1994; Berger et al. 1996). Here, we described another jasmonate effect on hypocotyl elongation under various light conditions. The hypocotyl elongation of endogenous jasmonate biosynthesis mutant aos was shown longer than wild type under low Rc or dark (P < 0.01) without MeJA, especially without sucrose. This indicates jasmonate signaling is important to the hypocotyl elongation (Figure S3). And the hypocotyl elongation (Fig. 1) in coi1-16s were suppressed by a high jasmonate concentration, which supports previous results showing the jasmonate-responsive gene expression of the coi1-1 null mutant upon jasmonate treatment or wounding (Chung et al. 2008). Although basal or jasmonate-mediated expression of these genes in coi1 is much lower than in the wild type, these genes still weakly respond to jasmonates even in the coi1 null mutant (Chung et al. 2008). Although coi1-16 is not a null mutant, but light signaling-related phenotype of the coi1-16 mutant has been analyzed and similar results to coi1-1 null mutant were shown (Robson et al. 2010). We suggest that a COI1-independent jasmonate signaling is also present in hypocotyl elongation. (+)-7-iso-JA-L-Ile, which is synthesized by JAR1 from jasmonic acid (Staswick and Tiryaki 2004) is the bioactive form that inhibits root development (Fonseca et al. 2009). In contrast to its isomer (−)-JA-L-Ile, (+)-7-iso-JA-L-Ile is the true ligand of the jasmonate receptor SCFCOI1-JAZ protein complex (Fonseca et al. 2009), which mediates binding between COI1 and JAZ proteins and regulates downstream gene expression. Indeed, (+)-7-iso-JA-L-Ile had the strongest effect on root development in both the wild type and jar1 (Fig. 2c). MeJA, however, showed a stronger effect on hypocotyl elongation (Fig. 2a, b). (+)-7-iso-JA-L-Ile treatment with a higher concentration also showed weaker effect compared to the MeJA under Rc (Fig. 2d) and dark. Moreover, jasmonic acid, a less volatile compound than MeJA also showed stronger effect than (+)-7-iso-JA-L-Ile (Figure S1E). These results suggest that different uptake of MeJA and (+)-7-iso-JA-L-Ile between root and shoot or volatility of the MeJA is not the reason for the different effects of the jasmonates on shoot and root. There is an unknown jasmonate signaling involved in the hypocotyl elongation suppression. Furthermore, the mutation on COI1 almost totally abolished the (+)-7-iso-JA-L-Ile function under red light (Fig. 2d). Although we cannot completely exclude a possibility that coi1-16s is leaky even under normal growth conditions, we speculate that a COI1-independent pathway is present and mediated by an unknown jasmonate other than (+)-7-iso-JA-L-Ile which has a central role in COI1 dependent jasmonate signaling. It should be noted that (+)-7-iso-JA-L-Ile showed weaker effect than MeJA even under dark (Fig. 2a). This result together with Figure S1A and S1B indicates that COI1-independent and MeJA-specific response is present even under dark. In this aspect, it is also of interest that under Rc, hypocotyl elongation of myc2 mutant is more sensitive to MeJA treatment than under dark (Figure S2A, S2B). MYC2 is known to be a major jasmonate signaling component, and mutation on MYC2 leads to insensitivity to MeJA treatment for root elongation. However, the present results indicate that MYC2 is more important for jasmonate function under dark than Rc. Although redundant effect of MYC2, MYC3 and MYC4 might be responsible for the sensitivity to MeJA under red light (Fernández-Calvo et al. 2011), our results suggest that under Rc, jasmonate inhibit hypocotyl elongation in both COI1 dependent and independent ways, and MYC2 may participate in the COI1 dependent signaling under all light conditions. COI1 independent pathway may be enhanced under red light, which is probably mediated by MeJA or other unknown jasmonate derived from MeJA. Furthermore, in Rc, MeJA showed stronger effect on hypocotyl elongation (Fig. 1a) than other light conditions. It suggests that except the general signaling pathway in all light conditions, another unknown signaling pathway was activated under Rc. The phyB-9 was shown to be partially insensitive to jasmonate treatment under red light compared to Col. As a red light receptor, phyB play a pivotal role in the red light signaling. These indicate that phyB is involved in jasmonate signaling leading to the stronger effect of jasmonate on hypocotyl elongation under red light. As shown under Rc, jasmonate inhibits hypocotyl elongation in both COI1 dependent and independent ways. Moreover, it was shown that hypocotyl lengths in MeJA-treated phyB-9 mutants under Rc were quite similar to those in wild type under dark (Figure S1A, S1B). We suggest that under Rc, well known (COI1-dependent) jasmonate signaling and the phyB-mediated signaling were combined and suppressed hypocotyl elongation in an additive manner. We speculate that phyB enhances COI1-independent jasmonate signaling under red light. In summary, the hypocotyl elongation of Arabidopsis was suppressed by exogenously supplied MeJA; SCFCOI1-mediated proteolysis and phyB are involved in this function. (+)-7-iso-JA-L-Ile showed a weaker effect than MeJA, suggesting that suppression of hypocotyl elongation was controlled by a different pathway from roots. Two mutants isolated by screening for the MeJA effect on hypocotyl elongation under Rc had mutations in PHYB locus. Further analysis indicated that phyB is involved in jasmonate effect on suppression of hypocotyl elongation under Rc. Jasmonate signaling interacts with red light signaling through unknown signaling pathway possibly in (+)-7-iso-JA-L-Ile independent manner. This (+)-7-iso-JA-L-Ile- and COI1-independent signaling under red light might be mediated by phyB.